Needless to say, I had everyone stopped so I can look for my camera, and snapped a few photos before I got in the car. I also had my phone with me, and took a few, but they didn't turn out as I wanted. Thus, these photos are a combination of my camera and cellphone. I haven't met a bird that I don't like and was so thrill to see another jay in my life. Pretty bird. It has beautiful colors. Regards. It indeed a scrub jay. 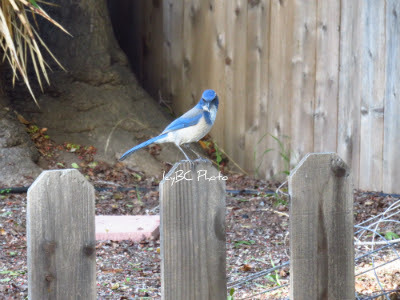 Down here (SoCal) we have scrub jays, but no true jays. These guys are so smart and have so much personality. We used to have two who would actually come into our house and land on us, both inside or out. We named them Sid Vicious and Johnny Rotten. They used to be only in southern California, but have now expanded all the way into British Columbia. I read in a couple of places that they are among the smartest of ALL animals. Bird and non-bird. That's really cool. This is the first time I've seen one of these birds, even in pictures. It's handy to have a cell phone camera. 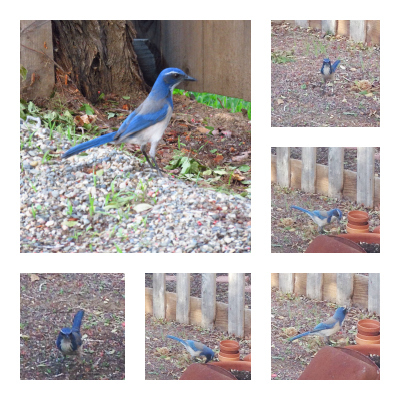 Did the Scrub Jay tell you that this was not my birthday? And this I do not need another 55 year to sort out.